It was a great action. Three years ago, seven activists went to the Alamance County Detention Center in Graham, North Carolina. Two were dressed like ICE agents (Immigration and Customs Enforcement) and a third looked like Lady Liberty. 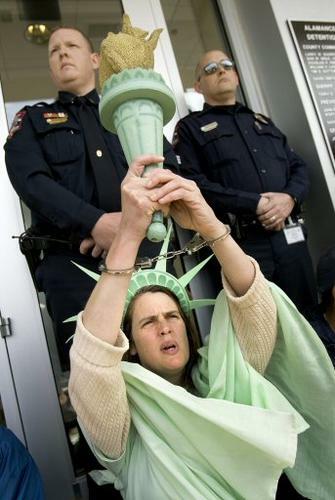 In a bold and creative action aimed at drawing attention to the unjust, unfair and racially biased immigration practices, the activists tried to convince jail officials to take Lady Liberty into custody. The rest of the activists blocked the doors to the jail facility. Immigration is a hot button issue in this area of North Carolina, which has one of the fastest growing Latino populations in the country, mostly because of labor needed in poultry processing plants and agricultural fields. Alamance County Sheriff Terry Johnson has taken a tough stance on undocumented people. Local authorities are part of 287(g), exercising authority as federal immigration agents under the Immigration and Nationality Act. The program is justified by its intent to pursue violent criminals and terrorism suspects. But in North Carolina, it has meant a lot of traffic violations for Latinos. In Alamance County, approximately seventy percent of immigrants detained through 287(g) were arrested on routine traffic offenses; another sixteen percent for driving while impaired charges, and only fifteen percent for felony charges. Furthermore, local law enforcement have set up roadblocks for the purpose of checking licenses outside of Latino markets on the weekends and on Sundays, they have stationed themselves at roads that provide access to Latino churches. Because these roadblock checkpoints are excluded from racial profiling data collection, it is difficult to know the statistics of individuals arrested pursuant to these tactics; however, their location is indicative of an effort to target Latinos as they go about their family shopping and worship. All of this means money for the Sheriff Terry Johnson. It is a perverse engine of economic growth for the region. The federal government paying local authorities $66 per undocumented per night in detention. In February 2008 alone, “bed rentals” to ICE brought in $400,000 in federal money, the sheriff boasted. But getting back to Lady Liberty. The police eventually did arrest her and the six others and local courts put them on trial. But, justice was not swift, because the last two defendants just reported for their jail sentences yesterday. Lady Liberty (aka Audrey Schwankl) has already served her sentence, another was convicted in district court, the cases against two defendants were dropped, and the last defendant — Juan Montes — died following heart surgery in October 2009. He was 44, married with two daughters. The small drama of two men headed off to jail — Patrick O’Neill and Francisco Risso — is happening against the backdrop of a national furor over immigration as the Supreme Court hears the case of Arizona’s draconian immigration law — SB 1070, which requires that law enforcement personnel question people about their immigration status if they have a reasonable suspicion that person is an illegal immigrant. Patrick and Francisco refused to pay fines stemming from their cases. They were sentenced to eight months unsupervised probation, ten-day suspended jail sentences, $200 fines, and more than $300 each in court costs. As O’Neill, a Catholic Worker and father of eight from Raleigh, told the court “On moral grounds with all due respect and good conscience, I cannot pay fines and court costs to a system that’s mistreating my Latino brothers and sisters.” We wish them luck as they begin their jail sentence, and say thank you for their nonviolent witness.